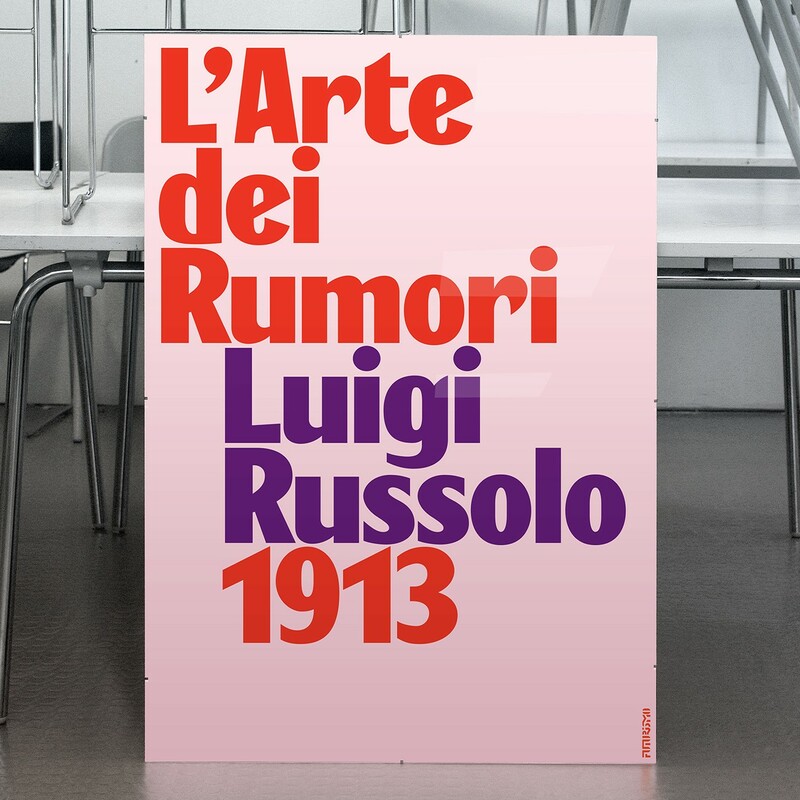 Rumori is a reconstruction of the typeface used on the front cover of ‘L’Arte dei rumori’, a seminal Futurist manifesto based on correspondence between Luigi Russolo and Francesco Pratella in 1913 and published in Milan three years later. The Rumori typeface was originally commissioned in 2014 by graphic artists Yeb Wiersma and Paul Bailey for use in their reappropriation of ‘L’Arte dei rumori’ as a public event. This took the form of six parades through the streets of Maastricht, the Netherlands, with over 40 participants marching to the strains of a live orchestra performing a score based on the diverse noises described in Russolo’s document. The procession carried a variety of banners and flags featuring the sound-words of the manifesto set in the new typeface, while corresponding signs were displayed on buildings, towers and windows around the city. Based on the 10 titling characters surviving on the front cover of Russolo’s noise manifesto, the design of the Rumori typeface is not a revival of a historical form in the traditional sense but more of a speculative reinvention. When research into the origins of the original wood type shown on the cover proved fruitless, MuirMcNeil drew on studies of a range of grotesque and gothic display typefaces from the period as key points of reference for the missing characters. The resulting prototype version of Rumori was published via TypeBrut in 2015. In 2017, MuirMcNeil revised the design extensively, refining character contours and adding a conventional alternate character set as an optional substitute for Rumori’s more eccentric letterforms, together with a useful set of ligatures and a stencil variant set, Rumori S, also available from the MuirMcNeil shop. Rumori is available for licensing from MuirMcNeil in a single bold weight, with corresponding italics, in sharp (Chiari) or soft (Morbidi) versions, the latter intended to suggest the worn impression of old wood letters. All versions are available in the Adobe OpenType Standard Latin character set.